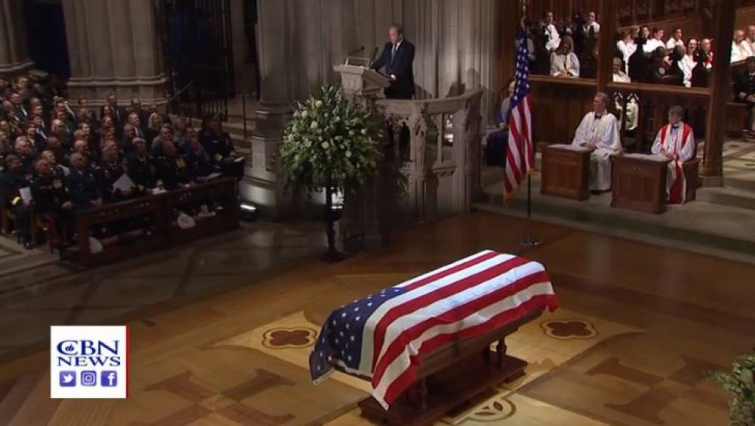 In the culmination of a state funeral service marked with laughter, tears, prayer, and praise, former president George W. Bush delivered a tearful, heartwarming eulogy of his father and America's 41st president, George Herbert Walker Bush at the Washington National Cathedral. The unmistakably religious service was permeated with gospel-centered traditional hymns, as well as a beautiful contemporary song performed by Michael W. Smith, a long-time friend of the Bush family. Every living president and first lady came together for the event: President Donald Trump and First Lady Melania Trump sat next to former presidents and first ladies, Barack and Michelle Obama, Bill and Hillary Clinton, and Jimmy and Rosalynn Carter. "Look! God's dwelling place is now among the people, and he will dwell with them. They will be his people, and God himself will be with them and be their God. 'He will wipe every tear from their eyes. There will be no more death' or mourning or crying or pain, for the old order of things has passed away." Bush, Sr., who passed away at 94 years of age, served as president, vice president, CIA director, and a soldier in World War II. Presidential historian and author Jon Meacham noted the president's achievements in his eulogy saying, "On his watch, a wall fell in Berlin, a dictators aggression did not stand." His son, former President George W. Bush delivered a powerful eulogy for his father, honoring the high value he placed in faith and family and giving back to your country. "He looked for the good in each person, and he usually found it," Bush said. "To us, his was the brightest of a thousand points of light." Holding back tears, he called his father "a great and noble man, the best father a son or daughter could ever have."